When Jefferson Colby frontman Danny Mabe first picked up a guitar several years ago, he figured out how to play it almost overnight. By the time he had recruited his older brother Matt and childhood friend Jeff Moore to accompany him on drums and bass respectively, he had already written a few songs. In a matter of months, Jefferson Colby was winning battles of the bands and making a record, Inadaze. The whirlwind hasn’t slowed in the last four years. In one day of recording in 2007, the band laid down the basic elements of the 17 songs that would eventually become two CDs: My Cosmic Self (an EP that came out last year), and Octopus, an album that will be officially released in February. That’s not all. On the first Friday in December, the Mabes and Moore gathered in a Hurst studio and laid down the basic elements of what will be the young band’s fourth disc, Semantics (Metaphysical Mad Music). The band plans to spread the wealth so to speak. My Cosmic Self is available on a pay-what-you-can basis for download at jeffersoncolby.bandcamp.com. The bandmates are more interested in exposure than profit, and by not spending a lot of money to record, they already seem to be one step ahead of similar bands. 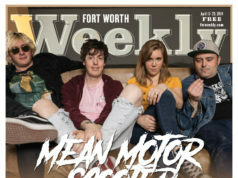 But the Mabes and Moore feel their mix of hard, melodic, psychedelic rock is being overlooked in indie-obsessed Fort Worth. Fan support, Danny said, “is going to have to come from someplace else.” Like New York City, maybe, where the band will play this spring, or the cities from Boston to Kentucky that Jefferson Colby will hit on tour. Maybe out-of-town fans will be more open-minded than Fort Worth’s. The sound is undeniably superb and frequently, delightfully schizophrenic. Octopus songs such as “Autonomous Minor,” “Marsupials,” and “Burning Paper Dolls” tend to space out at times via heady guitar effects and long instrumental reveries. Semantics, however, is “balls to the wall 80 percent of the time,” Moore said. Inspired by lucid dreams and transcendentalism, Danny’s lyrics can often be as trippy as the music. He describes his song titles and lyrics as “colorful” but promises, “It all means something.” He matches his lyrics’ Technicolor grandeur by employing a wide range of effects pedals on his guitar. “Danny is a song bank,” brother Matt said. “He sometimes comes up with stuff that is over my head. He stretches me out, makes me think outside the box.” Danny now plays the piano and knows the fundamentals of harmonics. But like Matt, a monster musician who also plays drums in the grunge-rock group Stella Rose, Danny is a natural when it comes to music. He is studying at TCU and still has a few more semesters left before he earns his degree, but he’s putting his formal education on hold as of next semester. “When I know what I want to do so clearly, I should at least attempt it,” he said. And what Danny wants is to make music full time. 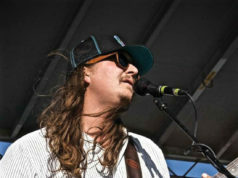 Matt tried doing music full time after recently finishing his degree at TCU, but he said he got tired of being broke. Now he works in the graphic design department for a Burleson news organization and plays in several local outfits in addition to Stella Rose, including Quaker City Night Hawks and a classic-rock cover band. He also plays bass for Quo, fronted by the eldest Mabe brother, Chris. Moore works full time, goes to school, and helps his wife raise their young son and daughter.